When I get confronted with a really good idea in fiction I feel a little thrill at the possibilities and potential stories it creates. 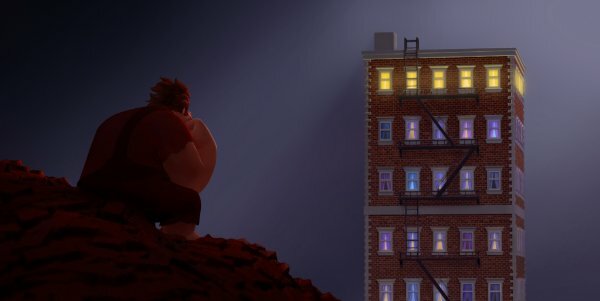 I felt that liberation at the beginning of ‘Wreck-It Ralph’. Very quickly it establishes itself as a film that can become whatever it wants, a film that can drape itself in whatever aesthetic it chooses, a film that’s only limited by the imagination of its creators. ‘Wreck-It Ralph’ is the self-titled story of a video game bad guy. He’s the villain in a Donkey Kong-like 1980s arcade machine called ‘Fix-It Felix Jr’. Ralph’s existence consists of smashing up an apartment building, then battling Felix, the game’s hero. Felix inevitably wins, and Ralph is then unceremoniously thrown off the top of the building into a pool of mud. He’s been thrown off that building day after day for decades, and with the game’s 30th anniversary just around the corner, he’s suffering a kind of existential ennui. He isn’t an evil person, he’s just someone playing the role of a bad guy, and yet he’s ostracised by the community within the game. After being snubbed one too many times, he snaps, setting out into the wider world to prove that he can be heroic rather than just villainous. Ralph at his support group for bad guys. This wider world is the games arcade that Ralph’s machine is in. When the arcade is closed characters freely travel from one game to the others. Brilliantly, the world has shades of ‘Who Framed Roger Rabbit’, with the population consisting of ‘real’ videogame characters. When Ralph attends a ‘bad guy’s’ self help group he hangs out with M. Bison and Zangief from ‘Street Fighter’, Dr Robotnik from ‘Sonic the Hedgehog’ and Bowser from ‘Super Mario Brothers’. Seeing these characters fraternising with each other provides some of the funniest moments in the film and goes a long way to making Ralph feel like a ‘classic’ character with a familiar story. Clearly these writers and designers know their stuff, in wider shots you see more obscure characters walking by and graffiti referencing some pretty obscure gaming trivia. The relish with which these references are made underlines one important fact about the creators of this film: these people get it. 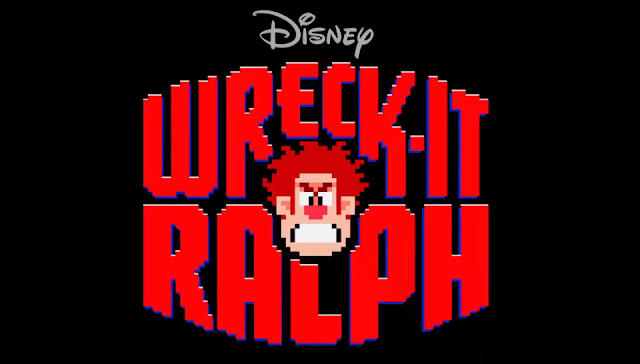 'Wreck-It Ralph' isn't a film made by people trying to appeal to gamers, it's a film made by them. The final character I found slightly less fun. That’s Vanellope, the bratty, cheeky girl outsider living on the outskirts of the ‘Sugar Rush’ world. She’s voiced by Sarah Silverman, and while I feel like a grump for saying it, she annoyed the crap out of me. Granted, this is a film for children, and she’s a good child identification character, but she's a never-ending pun machine and she drove me up the wall. When we’re in the world of ‘Fix-It Felix Jr’ the animators brilliantly exploit capture the blocky retro-game aesthetic; everything feels like a videogame, from the cuboid bushes to the way cake splatters in pixels across the walls. But ‘Fix It Felix Jr’ is from the 80s, and our characters travel from there into more modern games: ‘Hero’s Duty’, a space marine shooter and ‘Sugar Rush’, a sweets based kart racing game. These two, particularly ‘Sugar Rush’, unfortunately feel pretty generic, environments that could have been transplanted from any 3D animated film. Once we enter the world of ‘Sugar Rush’, we stay there and it’s at this precise point that ‘Wreck-It Ralph becomes less compelling. Nearly the whole of the ‘Sugar Rush’ sequence left a bad taste in my mouth. We switch gears from making jokes referencing videogames to jokes referencing sweets. So, our characters find themselves sinking into ‘Nesquiksand’, or pursued by angry Oreos. It’s not so much that they’re especially bad jokes, more that they have an unpleasant whiff of product placement about them. I feel like a bit of a hypocrite complaining about this, one of things I must I enjoyed in the film was seeing classic videogame characters in the background of scenes, characters which are as much corporate figures as a brand of sweets. Even so, something about product placement for Nestle doesn't sit right with me. What’s more frustrating is that the film abandons its own compelling internal logic. Whereas the other ‘worlds’ are small and self-contained, constructed tightly around the rules of the game they’re depicting, ‘Sugar Rush’ is it’s own mini-civilisation, much of which bears little resemblance to the kart racing genre it’s supposedly parodying. It feels like you've stepped into a blander film; everything being pastel pink gets visually cloying pretty fast. I found myself wishing the film would live up to its premise and let us see some more environments, but sadly not. It’s also here that the characters begin to come slightly unstuck. There’s a bizarrely disturbing scene where Ralph physically tortures someone for information. He picks up a talking gobstopper called Sour Bill, and licks him repeatedly until he tells him what he wants to know. Sour Bill’s reaction is sheer terror, and it’s deeply unpleasant to see our lovable protagonist torturing someone without consequence. ‘Zero Dark Thirty’ has been getting a lot of negative publicity for its torture scenes, but the torture seems slightly more sinister here. It's a worrying example of acclimatising children to the concept of the ‘good guys’ using torture to get information and at the very least the scene is a depressing symptom of a society that has grown to accept it.. But, despite the setting taking a boring and generic turn, despite the insidious corporate advertising that permeates and despite some character mis-steps, ‘Wreck-It Ralph’ remains worthwhile viewing, almost purely because the central characters are so likeable. We understand and sympathise with them, and Ralph is such a likeable, put-upon everyman that it’s impossible not to want him to succeed. ‘Wreck-It Ralph’ is a good film, one of the best non-Pixar 3D animated films yet, but unfortunately one that doesn’t quite live up to the promise of its premise.